I have been watching the progress of Lexus’ much raved LF-LC concept car since the day it broke cover at the 2012 Detroit Auto Show. Not because it’s my duty as a motoring journalist. But because the car is simply stunning. It’s Lexus’ most exciting product since the mighty LFA supercar and the more I looked at it the more interested I was. It wasn’t too long after the LF-LC launch, however, that it became a bittersweet moment. It turned out that Lexus had no intention of putting the LF-LC into production. It was purely just a design exercise. Ouch. Regardless, my message to Lexus at the time was – Just build it! Not surprising, it was a sentiment echoed by almost the entire car world. 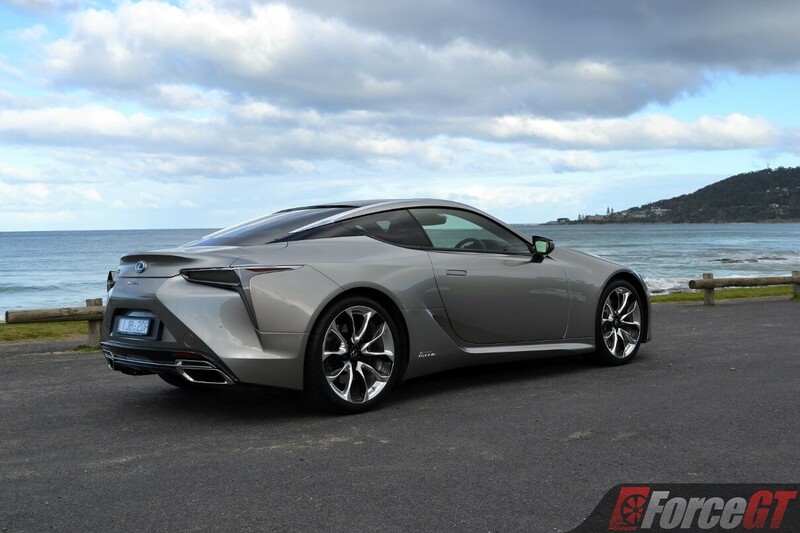 Such well received was the LF-LC concept that in the following year after its launch Toyota and Lexus boss Akio Toyoda finally heeded the overwhelming response and gave it the green light for production. Four years later, here it is. 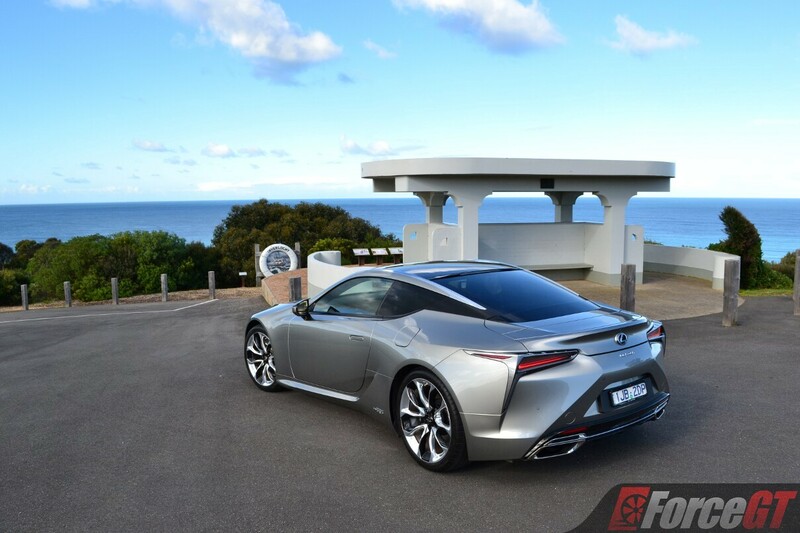 The all-new Lexus LC, looking nearly identical to the concept shown in Detroit. Who would have thought? I must say that Lexus deserves my full respect and credit, not just for bringing a concept show car which had no production intention to reality, but also for producing one of the most stunning, striking and beautiful grand tourers available today. To be able to challenge what has been, in my books, the most captivating coupe design – the Aston Martin Vanquish – says very much about the allure of Lexus’ latest flagship and halo. Perfectly proportioned, there isn’t a single bad angle about the LC. The bonnet is impossibly low and the rear haunches are ultra wide, giving the coupe a truly purposeful hunkered down look. The sweeping roof line tapers gracefully down to the rear deck and floats just above it, reducing visual mass. Down the side, elegant shoulder lines and side intake set off a sense of motion even when the car is stationary. 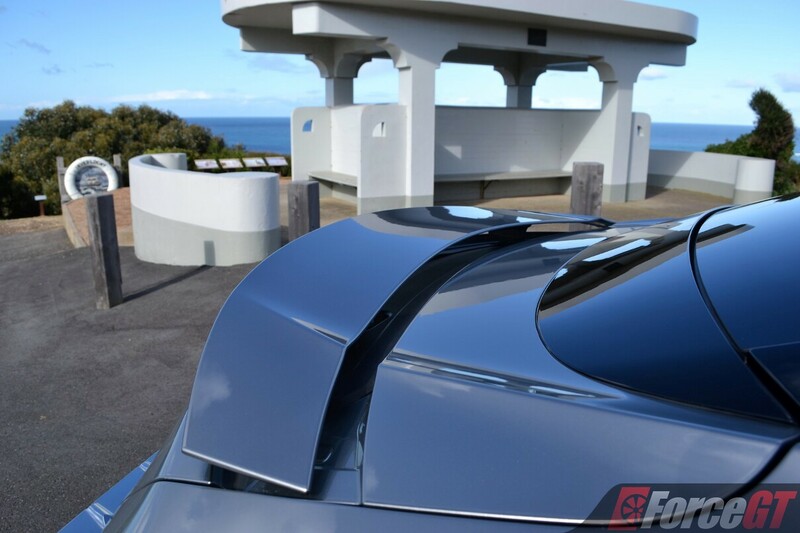 An active rear spoiler, fitted to my LC 500h test car (part of the optional Enhancement Pack), that automatically deploys above 85km/h adds to the athletic looks. Lexus’ trademark Spindle Grille, the subject of much criticism in the brand’s other models, works wonderfully in the LC. 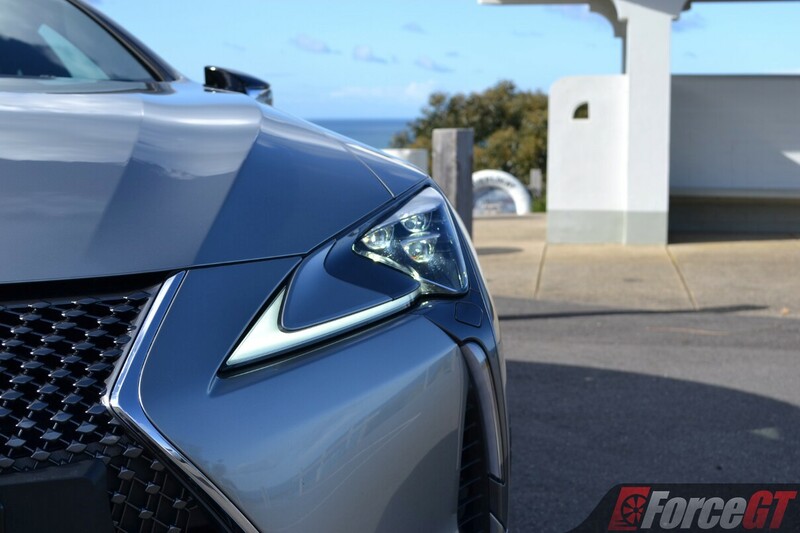 It’s low and wide, pulling the nose of the car right down, and together with those striking triple beam LED headlights and arrowhead daytime running lights, lend the car imposing road presence that is unmistakably Lexus. I applause Lexus for such an original design. It is like nothing we have seen on the road. And it looks expensive and desirable. The design is one that I could admire for hours on end, and one that never stops turning heads every where it goes. And did I mention the details? The new triple LED headlamp is specially designed for the LC and utilise one of the industry’s thinnest projectors to enable a low bonnet with a short front overhang. The grille features a radical new 3D mesh design that varies its visual tension through varying density of the mesh from top to bottom. 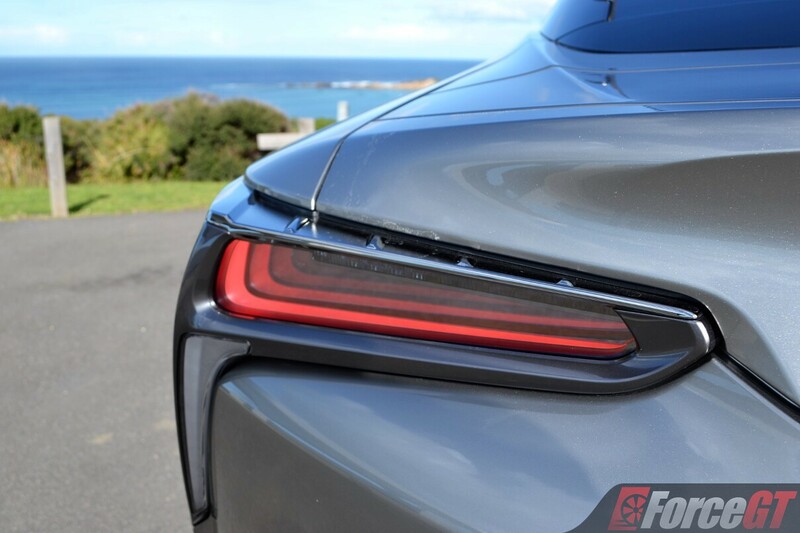 At the rear, the slim tail lamp makes use of an infinity illusion mirror to produce a very cool, sequential ‘L’ motif lighting effect that resembles that of a fighter jet’s afterburner. 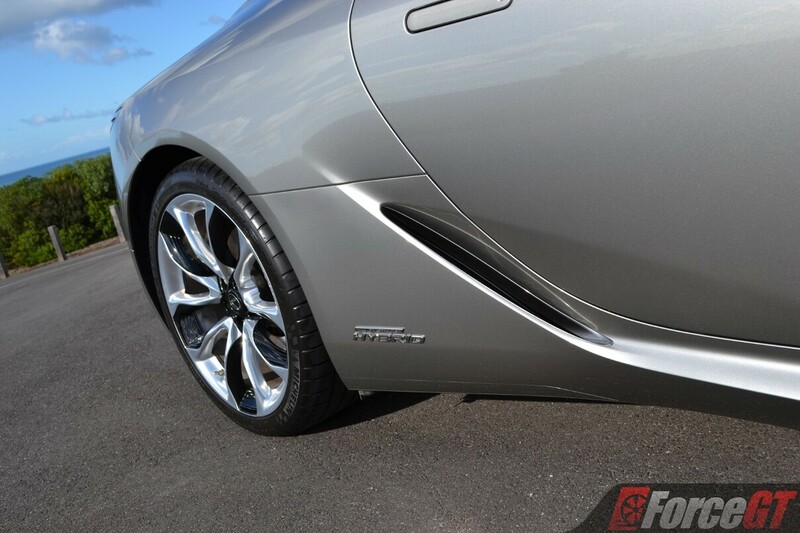 The LC rides on equally eye-catching 21-inch, forged aluminium wheels shod in Michelin Pilot Super Sport tyres measuring 245/40 RF21 front, and 275/35 RF21 rear. Like the exterior, the cabin is gorgeous and quite simply, a work of art. 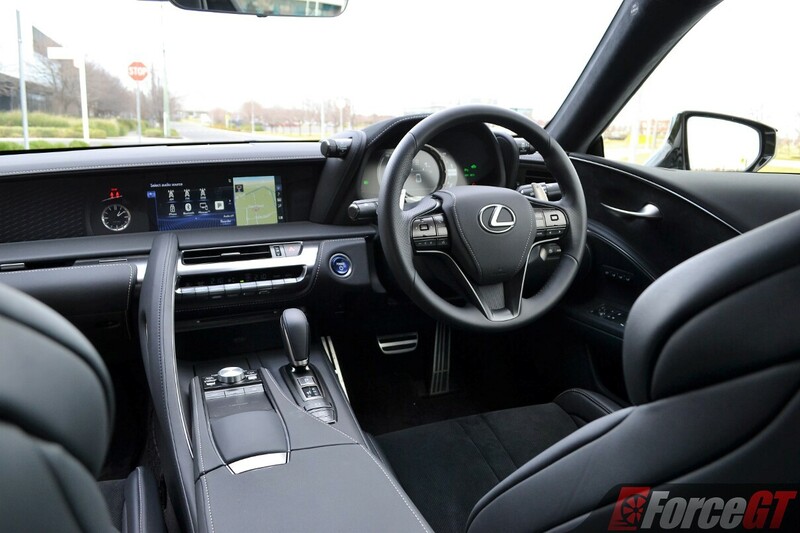 Staying true to the LF-LC concept and with a dose of LFA in its execution, the LC’s interior is characterised by a vast two-tier layered dashboard and raised center console. 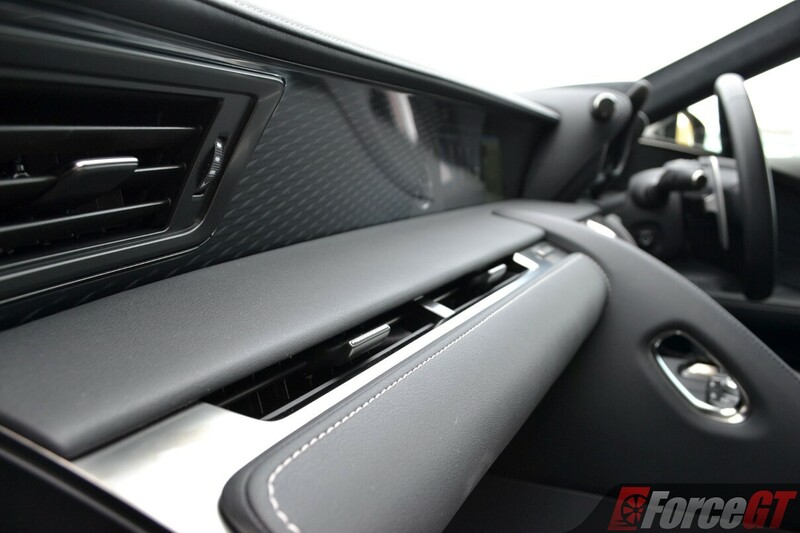 Lexus says the aim of the design was to create a contrasting ambience for the front row occupants – a sense of space for the passenger and a snug, race car-like cockpit for the driver. They have succeeded. The dashboard wraps around the driver, giving a sense of oneness with the car. The driving position is also spot on, you sit low and tight, with the steering wheel at chest level and excellent forward visibility through the vast front windscreen. 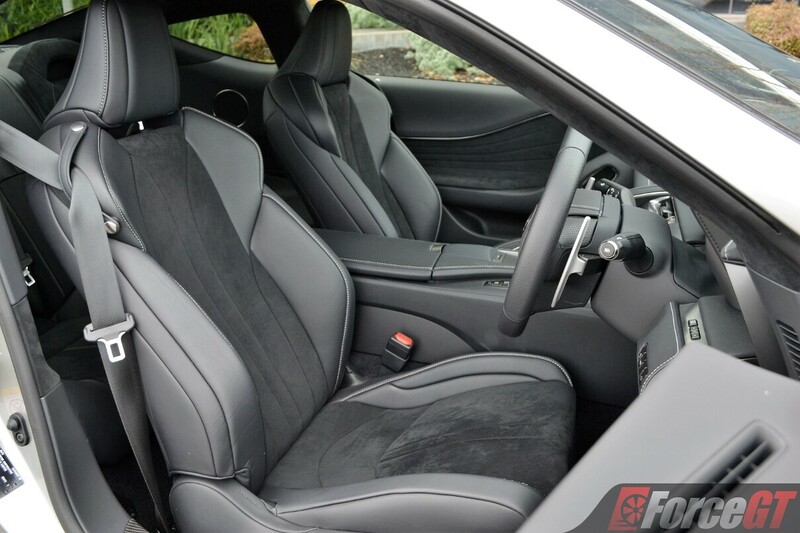 But it’s the craftsmanship, quality and details that impress me the most about the LC’s magnificent interior. The plate that houses the center console climate controls, for instance, is made from a single piece of polished aluminium. The steering wheel buttons are not plastics but cold-to-the-touch dark chrome. The paddle shifters are made entirely of magnesium alloy. 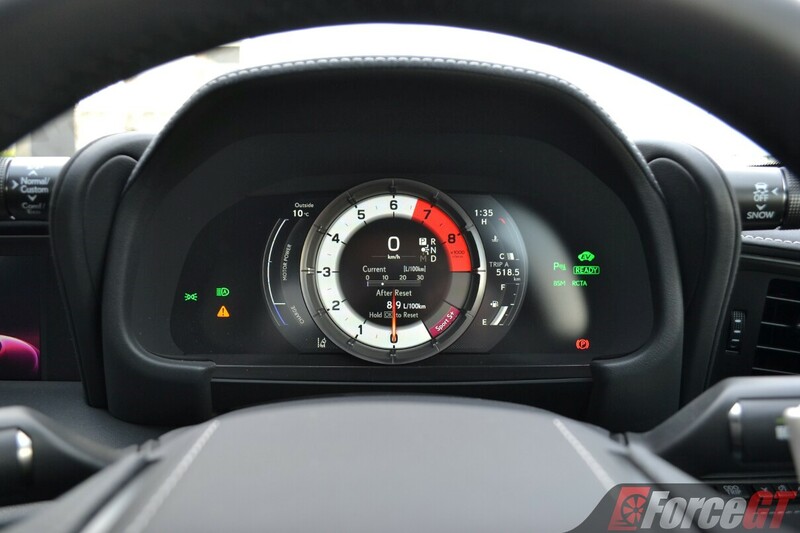 The digital instrumentation, with the super cool mechanically operated sliding bezel, is lifted straight from the LFA supercar. Seal of quality is further evident by the closing action of the center storage cover which slides forward gracefully, slows just before the latch and shuts with a delicate click. 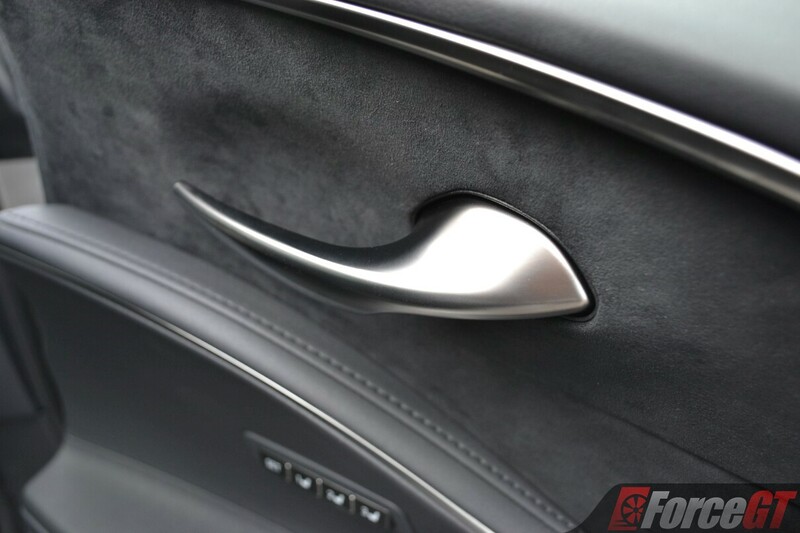 Even the door trim is a masterpiece. It’s leather and Alcantara wrapped, accented by a single continuous slim piece of aluminium that curves and follows the contour of the door trim. 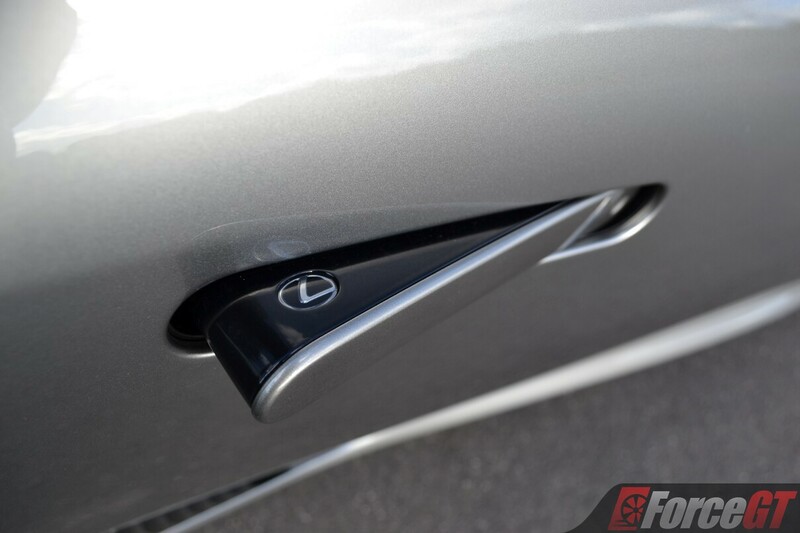 The door handle is milled from a solid piece of aluminium (no metal-look plastic part here). 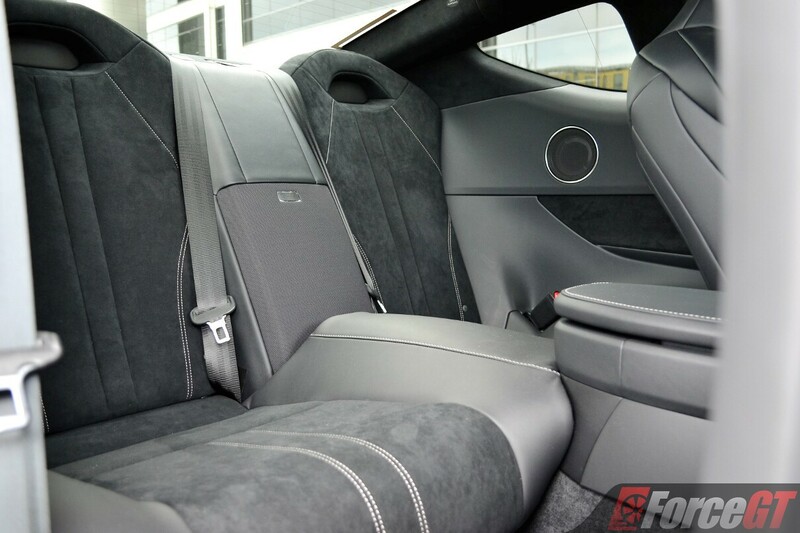 And there’s the draping effect of the Alcantara in the door panel for that ultimate organic design expression. 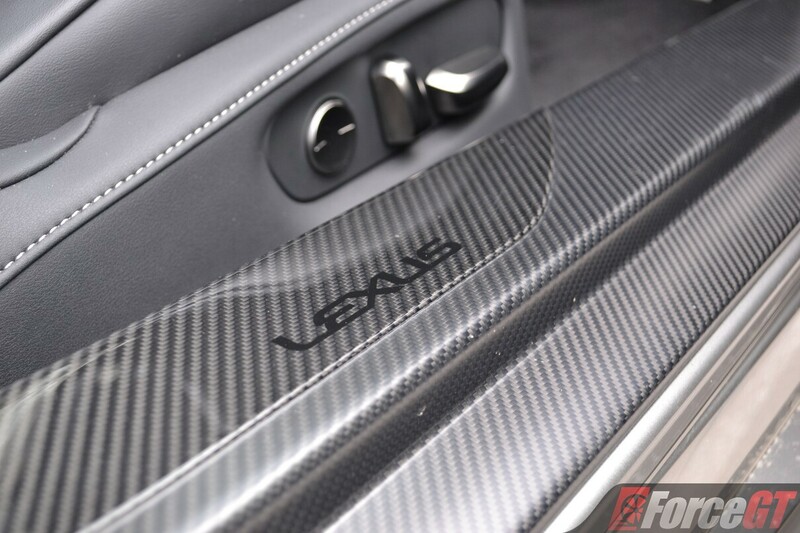 As expected from Lexus, fit and finish is second to none. After all, the LC is made in the same factory as the hand built LFA, at the Motomachi plant in Japan. 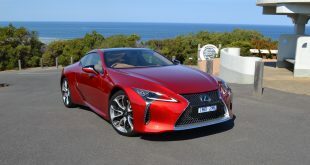 Positioned at the top of the Lexus line-up, the LC plays against the likes of BMW 6 Series Coupe, Mercedes-Benz SL, Porsche 911 Carrera, Maserati GranTurismo and Jaguar F-Type. Longer, wider and lower than the Lexus’ other high-performance coupe, the RC F, the LC range comprises the V8-powered LC 500 and 3.5L V6 petrol-electric hybrid LC 500h, both of which priced at $190,000 plus on-road costs. In the segment, the sticker puts the LC above V6 variants of the BMW 6 Series Coupe and Jaguar F-Type but below the Merc SL, Porsche 911 Carrera and Maserati GranTurismo. 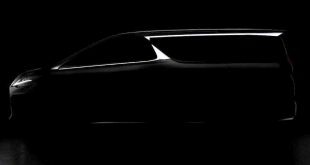 Underpinning the LC is Lexus’ new GA-L (Global Architecture – Luxury) platform that utilises steel, aluminium and carbonfibre. 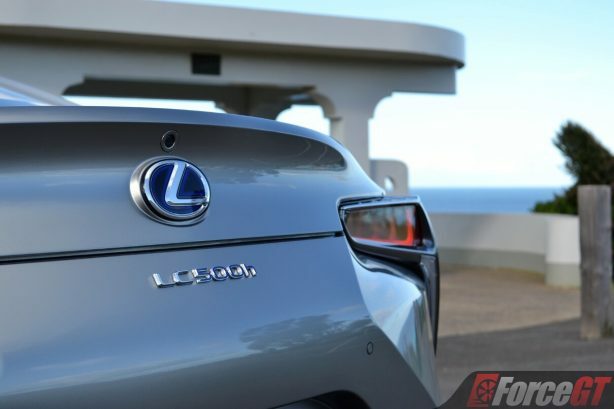 It’s claimed to be the most torsionally rigid Lexus ever built, and that includes the LFA. 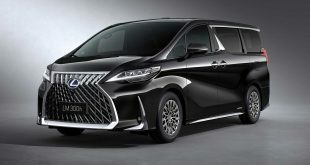 While Lexus says the new platform offers the optimum combination of strength, light weight and balanced 52/48 front-rear weight distribution (51/49 for the hybrid), I’m not quite sure on the middle bit. 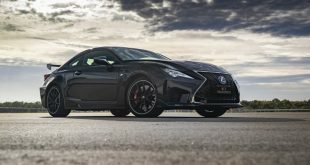 Weighing in at nearly two-tonne (the LC 500h tips the scale at a hefty 1985 kg), the Lexus is no doubt a very heavy car. 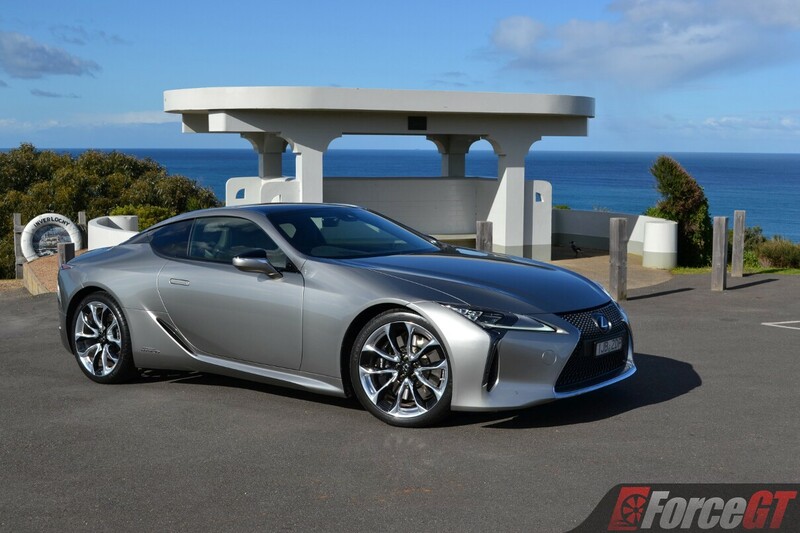 The LC 500h tested here is Lexus’ first model to utilise the company’s new Multi-Stage Hybrid drivetrain. The power unit is familiar, a 220kW 3.5-litre V6 petrol engine paired with an electric motor to deliver a combined power output of 264kW with 348Nm of torque. 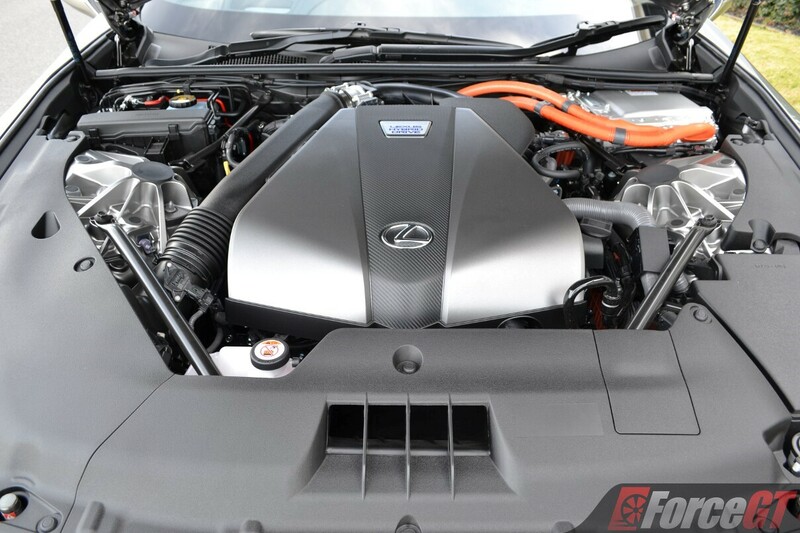 What’s new is the use of lighter weight lithium-ion battery for the first time in a Lexus hybrid and the way the power get sent to the rear wheels. The Multi-Stage Hybrid comprises of a 4-speed automatic gearbox and continuously variable transmission. The new 4-speed auto-CVT combo is able to multiply each of the first three physical gears in the automatic transmission three times – turning three real ratios into nine virtual ones; the fourth physical ratio acts as an overdrive, enabling the V6 to spin at a much lower rpm when cruising. In essence, the additional automatic gearbox works in combination with the CVT to deliver 10 specific gear ratios, just like the 10-speed auto in the non-hybrid LC 500. Lexus says the difference between the real gears and the virtual ones is barely perceptible. Indeed. Under normal driving, the LC 500h drives just like a conventional 10-speed auto, smooth, crisp, refined and devoid of the ‘rubber band’ effect so fondly criticised in CVT-equipped cars. It’s only when you switch to Sport+ mode, pin the throttle and take it up to its 6,600 rpm cut off that you start to feel a bit of that CVT elasticity, as the revs dances around the optimum powerband to enable the quickest acceleration. The same occurs on downshifts at higher engine speeds, it just isn’t as snappy as a twin clutch or conventional auto. 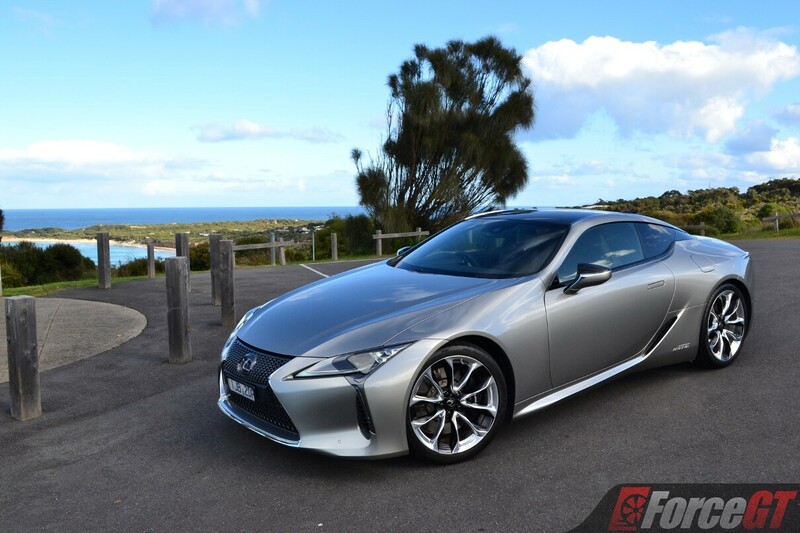 While it doesn’t give you the sporty shove in the back like the V8 LC does, the LC 500h still has more than enough punch to serve up a blast of a drive on the track or winding roads. Mid acceleration is strong and linear thanks to the instant torque from the electric motor. Though no scintillating V8 music, the V6 sounds properly enthusiastic, too. 0 to 100km/h takes a claimed 5.0 seconds, just 0.3 of a second slower than its V8-powered sibling. Pretty remarkable for a heavy hybrid coupe. The transition from electric to combustion is impressively seamless, with the tacho needle the only giveaway that the engine has kicked in. 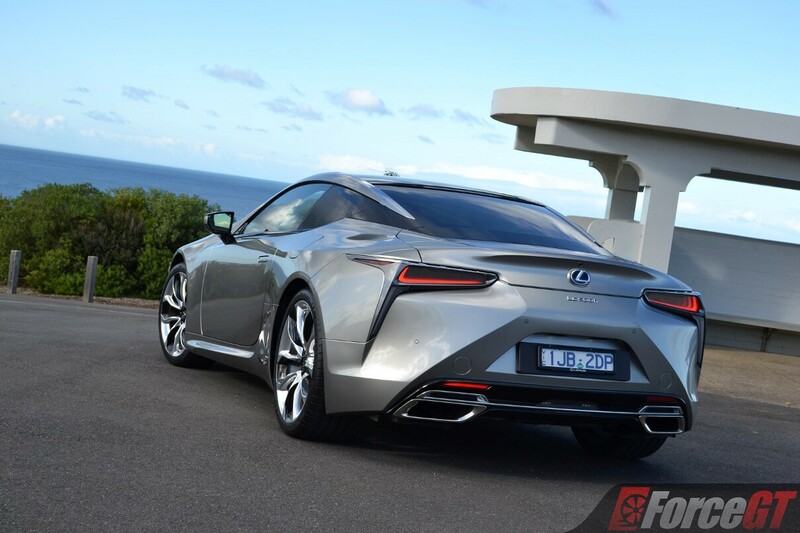 I must say this new hybrid drivetrain does suit the grand touring theme of the LC rather well. Tested at 9.0L/100km after over 700 kilometres of mixed driving, it’s economical too. While there are still areas where the hybrid drivetrain can improve, the dynamics team certainly got it right. 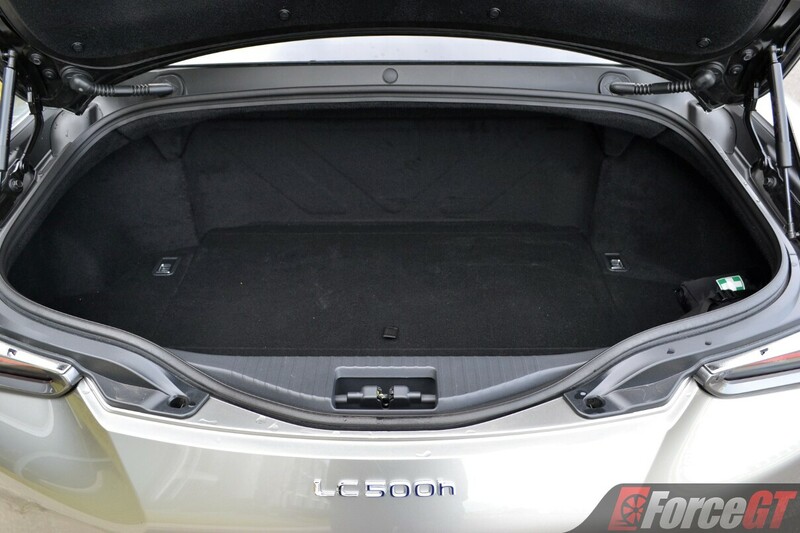 Despite its girth, the LC 500h feels smaller than it actually is around corners. Body roll is kept well under controlled and the nose points keenly into corners. 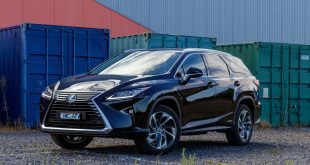 Unlike most large, heavy grand tourers, the Lexus doesn’t need to be coaxed into a bend, rather, it flows from one corner to another, thanks in most part to a well balanced chassis and a very stiff body. Grip from those Michelin rubber is also outstanding. The car feels planted, predictable and alive for the most part of my Skenes Creek to Barwon Downs test route in south western Victoria, only struggling for traction at the tightest hairpins. The electric steering is beautifully weighted, precise and quick if not a little muted in feedback. My test car comes fitted the optional variable ratio steering which, together with rear-wheel steering (part of the same option pack), further sharpen response and make maneuvering the large coupe through tight spaces a breeze. 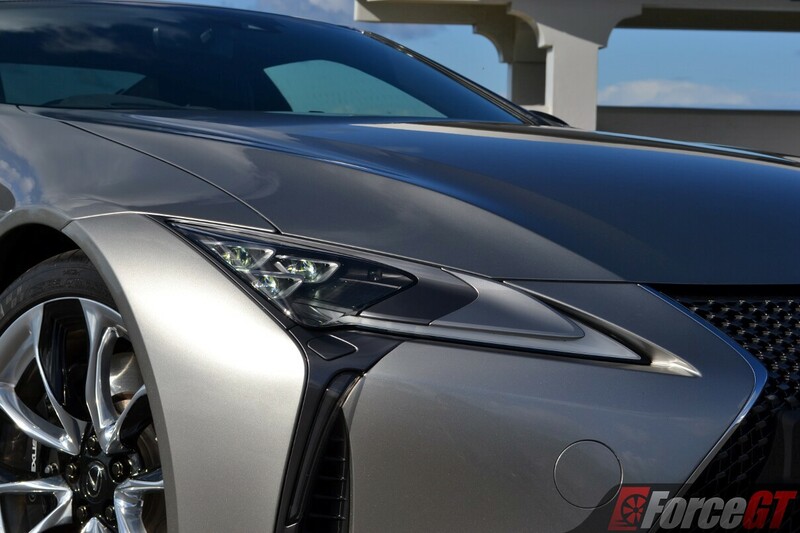 Braking through those six-pot calipers at the front and four in the rear, the LC stops promptly and confidently. The pedal is progressive, if not a little muddy in feel – blame it on the hybrid’s regenerative braking. 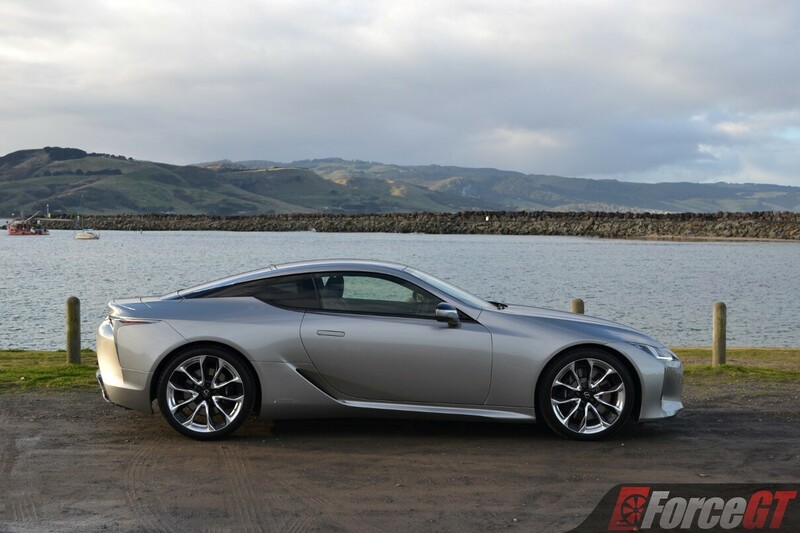 It’s a really easy car to drive this Lexus LC. And cruising around, it is simply magnificent. As sporty as it is around the bends, the adaptive suspension soaks up bumps and ruts with aplomb, resulting in a ride that is firm but every bit as smooth as a luxury sedan. The cabin is plush, serene and quiet, you get to hear only what the engineers want you to hear, which is the sound of the engine and exhaust. 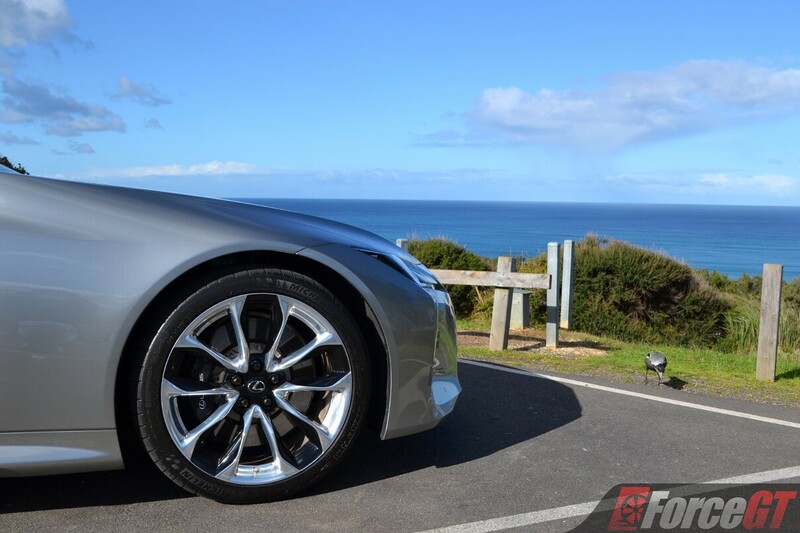 True to its name – LC stands for Luxury Coupe – the Lexus is a car you take on that 8-hour road trip, cocooning in those sumptuously comfortable and supportive front seats. As for the rear pews, the tight headroom and virtually non-existence legroom mean they are only good for storage or short trips. 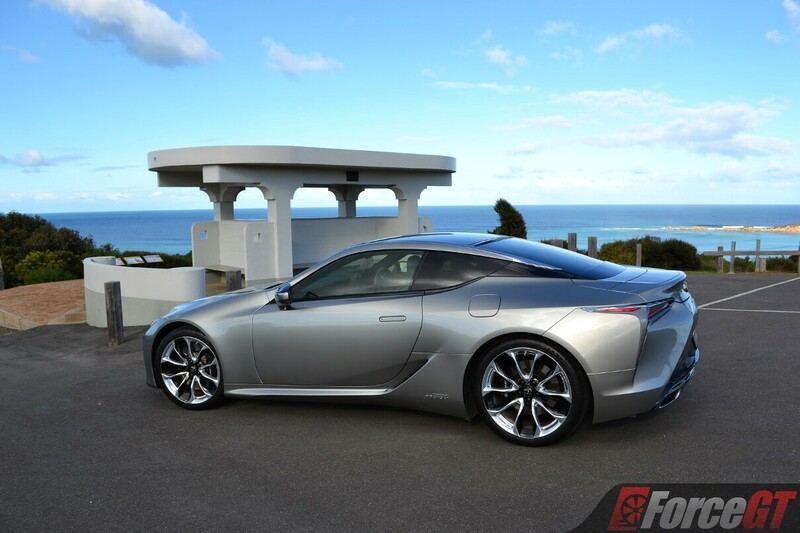 Typical of Lexus, the LC is comprehensively equipped. The 12-way power adjustable front seats are heated and ventilated, though the controls for them are inconveniently hidden away within the infotainment screen. A bespoke Mark Levinson premium sound system with 13 speakers is standard, so are the electrically adjusted steering rack and colour heads up display (HUD). 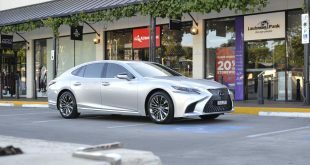 The LC also debuts the latest, much improved Lexus infotainment system with a 10.3-inch display, satellite navigation and finally, a voice recognition system that works, though the new Lexus remote touch interface still takes a bit of finesse to use. Think swish, fast, refined, and expensive, the BMW 6 Series and Mercedes-Benz SL quickly spring to mind. 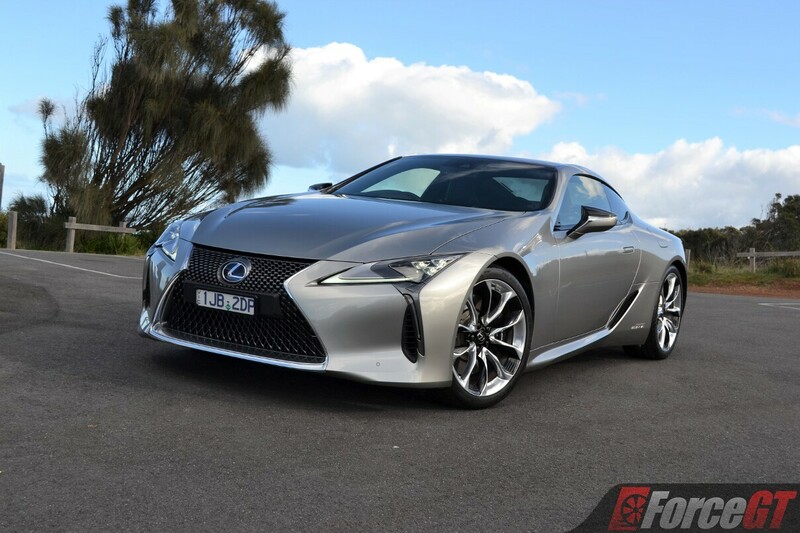 With the new Lexus LC, it’s time to think again. The LC isn’t just a bold and beautiful grand coupe, it’s the ultimate expression of unwavering attention to detail and impeccable craftsmanship bathed in swathes of luxury, exactly what this brand does best. 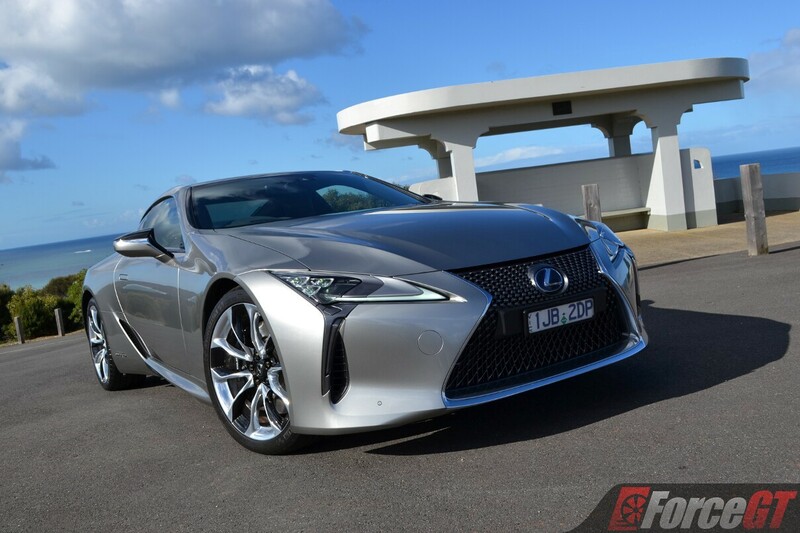 Despite lacking in a bit of theater, the LC 500h has enough grunt and a capable chassis for it to still feel quick and sporty. 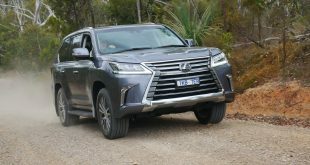 More importantly, especially for its target audience, it boasts the kind of efficiency that V8 and forced-inducted rivals just can’t compete with. As it turns out, the LC 500h is one of the most complete grand tourers you can buy for under $200k. Safety: 5-star ANCAP, 8 airbags, ABS, VSM, BA, EBD, Autonomous Emergency Braking, radar-sensing all-speed active cruise control, lane-keep assist, automatic high beam, reversing camera, blind spot monitor, forward collision warning, rear cross-traffic alert.